Where plastic boys are King... Or Queen even. Hi. I just love all things vintage. Clothing, Jewelry, and Especially Toys. So, on this blog I will post things that I own, owned at one time, or wish I owned now. 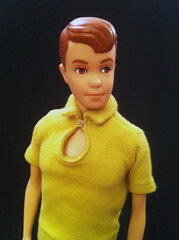 Especially Vintage Era Ken Dolls, and fashions. Thank you to Jef at the Keeping Ken website for the list of outfits. WIN! 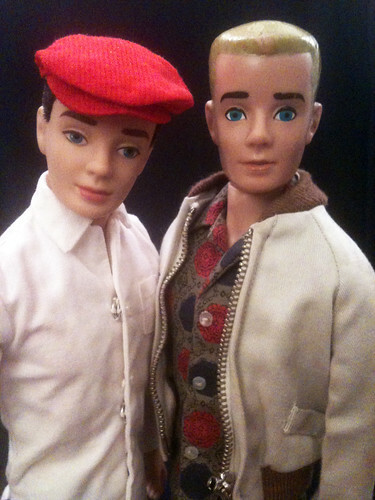 Vintage Ken and Allan Dolls coming home. I was lucky enough to win this lot for about $13. In this lot are 3 Allan dolls, 2 brunette flocked hair Ken dolls, and 1 brunette painted hair Ken. All of them are in kind of bad shape, but from the auction description, and picture it looks like they are good structurally, they just need some cosmetic restoration. I think what I am going to do with this lot is work on restoring them to their original beauty. Work on lightening their faces and legs and then giving them a repaint. Speaking of repainting....this will give me the opportunity to order some of the paints from restoredoll.com. I have been wanting to find out how the color matched paints looked in person. Over the weekend a package came in with a new addition to my ever growing family. The package was for what was listed on Ebay as an "Original 1964 Allan Doll." When I opened the box, initially I was upset. I had in my hand, what appeared to me, to be a vintage reproduction Allan. It's condition was far too good to be vintage. Once I got him home, I compared him with my reproduction Allan, and I realized then that I did in fact have a vintage model. Some little girl back in the 1960's didn’t like Allan, and kept him in a box it looks like. lol. This Allan came with a small check pattern sport coat, teal green slacks, yellow t-shirt, a red cap, brown pattern shorts, and pair of brown and white vintage loafers (Oh, and one Ken shirt hanger). All of the clothes are cute, but they are obviously hand made. Probably made from the official Ken patterns back in the mid 60's. The jacket is adorable, and fully lined. I am happy to include this in my collection. (the rest, no so much. lol) All of this for only $13 on Ebay. THIS is why I love Ebay so much. On another note, I have also recently won a brunette painted hair Ken. From the auction pictures he looks like he is in good condition as well. So, I am looking forward to that. The best part, he was only $5.87. Once he arrives, I will own almost all of the pre-1967 Barbie Line Male dolls. The only doll I won’t have at that point, is a vintage flocked hair Ken. I will have to see about acquiring one of those as well. My main reason for not having won one of those is, most i have seen listed for a reasonable price are in need of repair. The flocking on the hair is usually worn, and this model was notorious for having loose arm joints. ANYWAY, I suppose that is all for now. Just a quick update in my doll collecting life. I will post more pictures soon. The boys welcome a new family member. The boys welcome a new family member., a photo by crebofborg_2000 on Flickr. Just got my first Vintage Ken Doll in the mail. He is a blonde painted hair Ken. I think I am going to rename him Erik. Here is a rundown of what everyone is wearing. 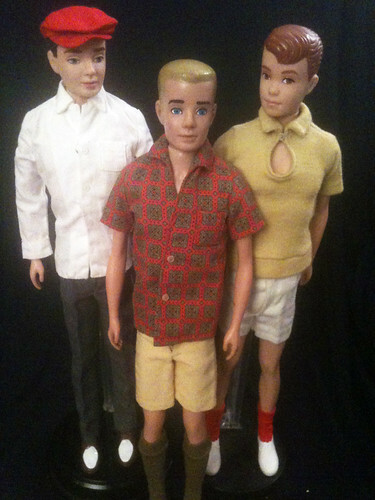 Flocked Ken is wearing the shirt from Victory Dance, grey pak slacks and brown and white loafers. He has on his favorite cap from Rally Day. Erik (Aka Painted hair Ken) has on the shorts, and socks from Sport Shorts, and a red pak sport shirt. Allan has a yellow polo shirt on, and the shorts from Time for Tennis. He has the red socks from Victory Dance, and white loafers. I have not posted pictures of Allan and Erik together yet. I think they make a cuter couple than Flocked Ken and Erik, but I have a weakness for Allan anyway. This is Allan. He is wearing a yellow pak polo shirt, the shorts from Time for Tennis, the socks from Victory Dance, and a pair of white loafers. Isn't he a doll? I love his red hair, and brown eyes. So cute. An update on my collection, and things I am thinking about lately. Well, I recently recieved my first vintage Ken doll. He is a blonde painted hair Ken from probably 1961 or 1962. As with everything doll related, I won him on Ebay for really good price. I was thrilled to find out that he came from the collection of someone who was a manager at Mattel in the mid 1960's. He is in very good condition, only having a few paint scrapes on the hair. I think I am going to rename him Erik. He just looks like an Erik to me. 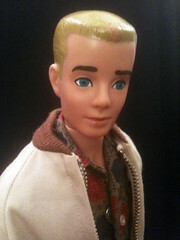 Plus, I have decided to keep my vintage reproduction Ken named Ken. I dont know why, but I am horrible when it comes to renaming dolls. I usually like to keep them named whatever the company calls them. lol. In the picture Erik is wearing The shirt from the Sport Shorts outfit. And, even thought you cannot see them, he has on a pair of brown pak slacks. Oh, and the tan pak windbreaker. Ken and Erik. Getting to know each other..., a photo by crebofborg_2000 on Flickr. Ken wanted to welcome Erik to the neighborhood. They think they are going to be good friends. Ken is wearing the shirt from Victory Dance, grey pack slacks, and his favorite hat from Rally Day. Erik is wearing The shirt from Sport Shorts, brown pak slacks, and the tan windbreaker.